The Educational Herb Garden aka the Herb Collective is a MAPG project that consists of a residential herb garden and a group of people, from novice to experienced individual, interested in learning more about herbs, medicinal and otherwise. We meet every other week during the growing season. For most meetings we have a guest speaker who teaches us about a particular herb or process and we perform duties necessary to maintain the health and beauty of this special space. We recommend joining the MAPG Google Group to stay updated on the Herb Collective meeting details as well as other permaculture topics. The project is located just 2 miles north of Madison at 3919 Gray Road, DeForest. We hope to see you in the garden! If you want to check the status of a work night, need help with directions, or have any other questions please call Jean Schneider at 608-513-0016. We meet rain or shine! There is an indoor space for the talk if the weather won’t allow us to be outside. Please check back the week before each date for the DIY project materials you should bring with you! 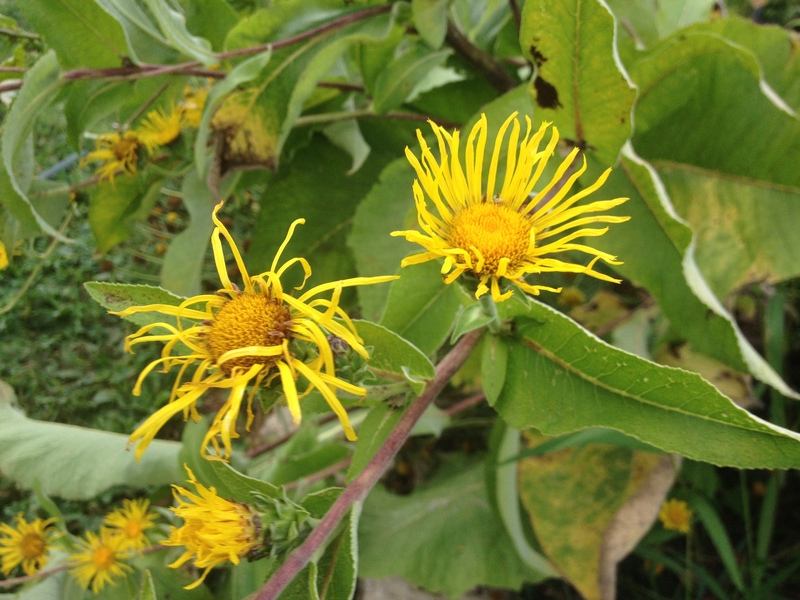 In the past our herb talks have been on violets, dandelions, plantain, American skullcap, yarrow, Monarda/bee balm, lady’s mantle, elecampane, Aronia, rugosa rose, and roots including marsh mallow and sochan (green-headed coneflower). We will affix a plant to each date as the plants come into harvest for our take-home DIY projects or in some cases it may be show and tell only. Donations are not required but are much appreciated to help us maintain the herb garden, add plants and to have materials for our herb talks. Join herbalist Shannon Renne for a fun evening talk on Herbal Cocktails and Mocktails. Drinks for the whole family will be discussed along with a tasting of some of Shannon’s creations. She has been a mixologist for several area herbal fundraisers refining some recipes she will share with you! 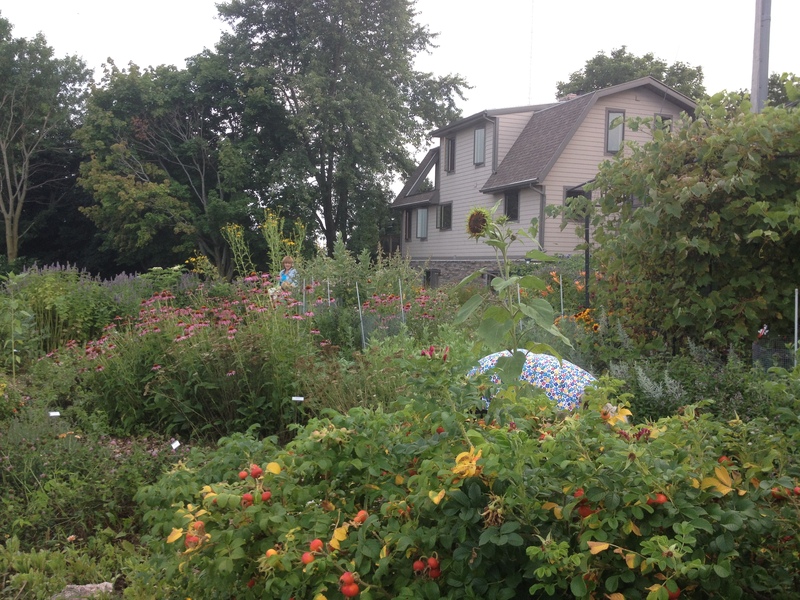 Suggested donation of $5-$10 will support the Madison Area Permaculture Guild Herb Garden. No one will be turned away for lack of funds. Please join us! The Herb Garden is at 3919 Gray Road, DeForest (Token Creek). Call Jean at 608-513-0016 with any questions. 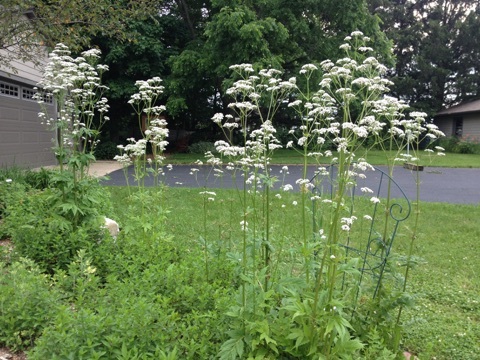 Herbalist, Ginny Bormann will lead this talk about using yarrow and goldenrod. Yarrow is excellent for your first aid kit, and for stopping bleeding anywhere inside and out of the body and can be used for much more. Goldenrod is a key plant in seasonal allergies, and surprisingly helpful with ragweed allergies. If you have some goldenrod or yarrow flowers at home or somewhere you forage bring them along. We will be making a tincture if we have enough plant material. Bring a small mason jar and vodka with you if you want to make a tincture. We have a small amount of supplies if you forget yours – a donation is appreciated. Herbalist, Ginny Bormann will lead this talk about using herbs for seasonal allergies. Ragweed season is just around the corner for many of us! What goes into making an herbal first aid kit? Something portable, you can take on your hike or in your car or maybe a larger, more elaborate one for at home. Learn about some must-have’s and options for other additions to your kit. Day Host-Jablonski will lead this talk. Come visit the Herb Garden and learn how to tell the difference between our two native St. John’s Wort – the medicinally used herbaceous and the non-medicinally used shrubby St. John’s Wort. We grow both in the Herb Garden so you can see the difference. 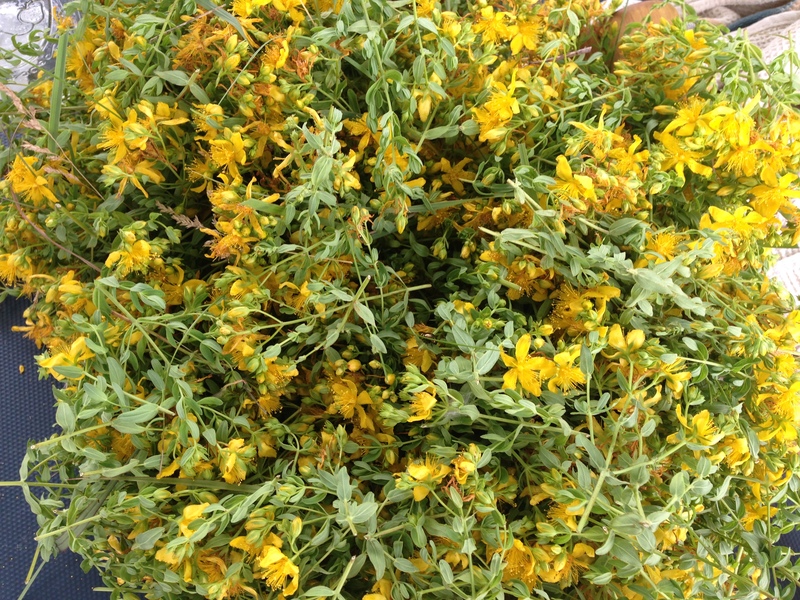 St. John’s Wort is ready to harvest now, so make sure you know how to ID it. 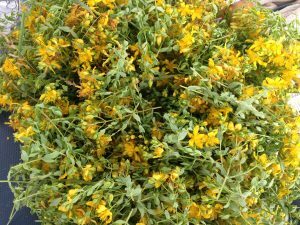 We will also see some tincture and infused oil in the works, try some tincture and oil too and share our St. John’s Wort stories. We will do a little bit of planting in the herb garden too. Herbalist, Jean Schneider with Nativa Medica will lead this talk. 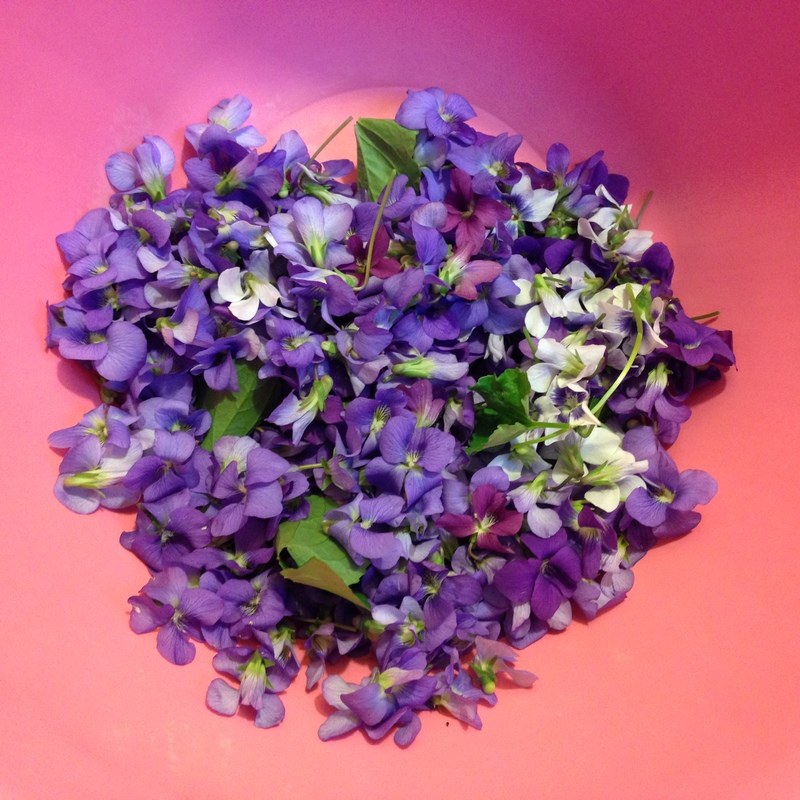 Our late spring and early summer flowers are some lovely sources of medicine making. Rose petal tincture is one of my go-to plants for grief and matters of the heart. Elderberry we all know about the berries and using elderberry syrup for our winter illnesses, but what about the flower? Interestingly, the fresh flower and dried flower have different properties and are used for different purposes. Learn some tips on how to make rose tincture as you go through the summer and how to gather and use your elderflowers. Herbalist Jean Schneider will lead this free talk. Many of our invasive plants were intentionally brought here because early immigrants couldn’t imagine life without them. Throughout time much of this common knowledge was lost to most and these plants are looked upon with disdain. Your local herbalists know how valuable these plants are for our health and everyday healing. We will talk about changing local ecology and how our relationships with plants, either love or hate, affect us. 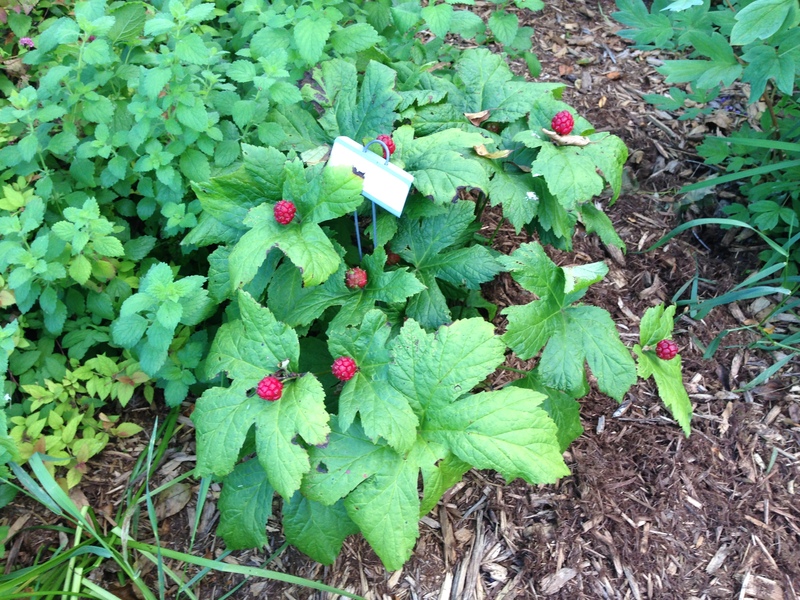 Plants like creeping charlie, plantain, bramble berries and garlic mustard will be covered. We will work with the plants tasting and trying out some of their uses as poultices, food and tinctures. Herbalist, Day Host-Jablonski, will lead this weedy talk. Please bring garden gloves and a small spade with you if you have them. Make sure your spade is clean before you come. If you would like to take plants home, bring a bag or container for them. Monday May 8th, 2017 6:00:-7:30: Spring tonic plants of violets and dandelion are the topic tonight. We will be talking how to cook with foraged leaves and flowers. Recipes and a handout will be provided. If you want to do the take-away DIY project please bring a pint mason jar with lid and high proof alcohol (like Everclear) or high proof vodka to tincture the dandelion leaf. We will forage here and make a group project together, as it take MANY violets to make a tincture or oil. 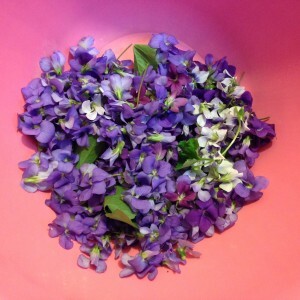 If you have violets at home or elsewhere that are in a chemical free space, pick the flowers (some leaves are good too) and bring them with you. The more the better! If you pick the day before, just put them in the refrig in a plastic bag. We welcome you to bring any food to share, more the better if it includes dandelion greens or violets! There will be dandelion leaf tea for us to share together. Monday September 26th 6:00:-7:30: Our last scheduled Herb Night of the year. Burdock is the topic tonight. We will dig up burdock roots and then go inside to work with the root and have our talk (with handout). Kate McFeeley of Prairie Pearls Greenhouse will be leading the talk. It gets dark so early now we won’t have a lot of time outside, and since we have had all this rain its a big buggy. Bring some bug spray, gloves and a shovel if you have them. If you have burdock you have dug up, please bring it along. Want to make a tincure? Please bring a small jar and some high proof alcohol (Everclear type, or 100 proof vodka) or a bag to take some roots home with you. Optional: bring any garden bounty you want to share or food or something you have made to share. Monday September 12th 6:00:-7:30: Its a PLANT GIVEAWAY! We have so many extra plants in the herb garden this year it has turned into part jungle. Bring your gloves, shovels, buckets and pots and take some plants home with you. There will also be plants that can be harvested instead of dug up, like several varieties of mints, lemon balm and mugwort and maybe even some stray rose hips and aronia berries to harvest. My grapes will be ready then and I can share some out too. Here are the plants we know we have a lot to give away, its not all inclusive, there are more: rosa rugosa (very large rose hips), anise hyssop, chamomile – a variety used for dye (spectacular plant! ), globe thistle (decorative, for the humming birds), lemon balm, peppermint, chocolate mint, mugwort (3 varieties, use for smudging and for sleep), bee balm (monarda), yarrow and more. If you don’t need plants, please come for the herbal community, help others fill their pots if you are able or just relax and chat. As usual we will have some herbal tea to share, and Ginny mentioned she will bring homemade raspberry ice cream. Bring your garden bounty to share too. We welcome monetary donations for the plants – donations will be used to purchase more plant varieties for the herb garden. If you can’t come but would like to donate, please make check out to MAPG and send to Jean Schneider 3919 Gray Road DeForest WI 53532. Please join us! Monday July 11th 6:00:-7:30: Monarda is a very useful native plant. Its common name is Bee Balm and is also known as Sweet Leaf by Native American healers. Both our native bee balm with the light blue/purple flowers (fistulosa) and the larger variety many of us have in our gardens with larger red flowers (didyma) are useful plants medicinally. Fevers, burns, nerves, bladder, sinus congestion and headaches and much more. 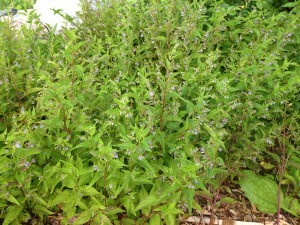 They can be used fresh or dried in teas or tinctures. Both the leaves and flowers are used. Its a great time to come and harvest some to take home and dry for use later, perfect to have on-hand for cold and flu season. There will be a handout for you to take home, bring collection bags and a small jar and high proof alcohol if you want to make a tincture. As always, bring your gardening gloves and clippers if you have them. There will be Monarda iced tea for everyone to try too! Jean Schneider will be leading our talk this week. Tuesday June 21st 9am-1pm with lunch! 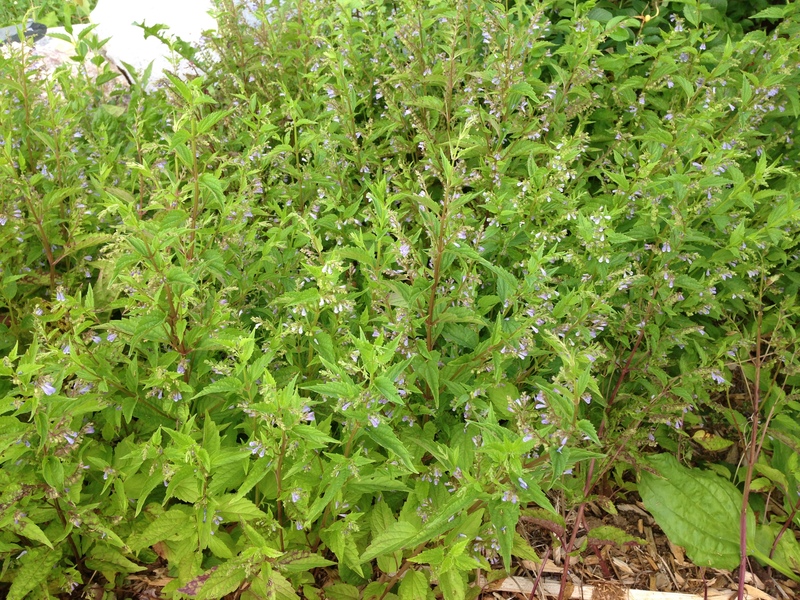 6:00-7:30: join us for an herb garden work party! We will be removing some unruly plants in the garden and adding more medicine herb plants. I have a bunch of plants I’m tending in pots that are ready for the garden! There is always a lot of fun to be had in the garden learning together about using and growing medicine plants. We also have lots of plants to share with people who come – either to dig up and take home with you or harvest for medicine making (comfrey, yarrow, rosa rugosa, mints, yellow balm, mugwort, wormwood, rue and more!) 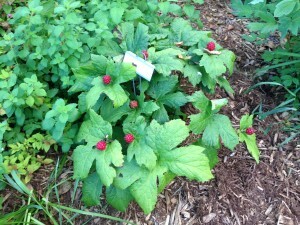 Depending on flowering there may be other plants ready to harvest too (anise, lavender…) There is rhubarb I can share. We really appreciate the help!Ginny and I will be providing a home-made lunch for everyone too. Please let us know if you are thinking of joining us so we can make sure there is enough for everyone. Ginny has been providing treats at all of our free herb talks and is a fabulous cook! June 13th 6:00-7:30 – Comfrey. The comfrey is just starting to flower now. This is a very useful plant to use in salves in healing cuts and scrapes and as a tea for keeping bones strong, healing broken bones and as a nutritive tea for digestion. Come learn more about comfrey, harvest some leaves and flowers for tea, and even dig up some plants to take home with you for your garden! The rue is also flowering now and ready for harvest for spiritual uses, rosa rugosa plants to dug up and take home with you, peppermint/ spearmint/ chocolate mint ready to be taken home with you as either plants or cuttings for tea. We also are putting out a call to help with pulling out some unruly plants – we appreciate your help with this anytime, just call or send us a note with when you want to come. Bring a friend! You are welcome to dig up plants and do harvesting if you are coming to work in the garden. THANK YOU! May 23rd 6:00-7:30 – Yarrow. Lots of yarrow ready to harvest and dry to have on hand for teas or to start a tincture. The young spring leaves are the best to use in your tinctures, adding the flowering tops to your tincture later on. Handout on how to use this common plant for acute conditions. Also there are enough yarrow plants for us to divide and send home with people. Bring high proof alcohol or vodka and a small jar if you want to do the tincture. Bring a few plastic bags if you want to dry yarrow leaves or take some plants home with you. May 9th 6:00-7:30 – Violets. They are just starting to flower and come in many colors. We will forage here and make a group project together, as it take MANY violets to make a tincture or oil. If you have violets at home or elsewhere that is in a chemical free space, pick the flowers (some leaves are ok too) and bring them with you. The more the better! If you pick the day before, just put them in the refrig in a plastic bag. As always we will have a handout for you to take home too. We welcome you to bring any violet items you have made to show the group. If you have any chickweed in your chemical free yard, pick some and bring it with you! Ginny is bringing some goodies for us to try again – last week she brought a delicious dandelion pie and made some cooked dandelion greens for us to try. We all make tinctures to take home too.